An entrance to an Avian Temple. Dome: This temple format consists of a building with small pyramids surrounding a dome at the center, similar to the architecture of a capitol building, with stairs that reach to an altar. Below lies winding staircases and large rooms with various Avian imagery, along with many pools of water. Outpost: A small temple building surrounded by a moat, it's simple nature is deceiving as under it lies a collection of long winding hallways filled with guards and loot. 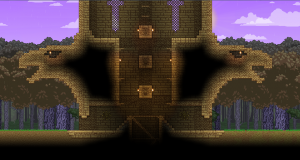 Tower: A tall temple structure which leads to a room with an open area at each side. Beware of climbing upward in this structure; temple guards have the advantage due to ranged weapons, and may shoot down at you. Avian Temples are not well lit; it's recommended to bring a light source when exploring, or gather some torchs from within the temple. Avian Temples are not to be confused with Avian Tombs, which has some similarities, but can be differentiated easily by their grey construction blocks. Temples were one of the earliest dungeons, playable through most of beta. Basic treasure can be found in most containers while valuable treasure is in themed chests. Valuable treasure occurs in basic containers but at lower rates. Avian Emblem Decorative 180 I swear the eye is following me around the room..
Avian Moon Emblem Decorative 80 This emblem commemorates the Avians' first flight to the stars. Avian Prayer Altar Decorative 80 The altar is covered in carvings of a winged god. Avian Server Decorative 60 This Avian server must contain a vast amount of data. Avian Spear Rack Decorative 70 The rack is filled with antique Avian spears. Avian Throne Furniture 75 A masterfully crafted throne, fit for Kluex himself. Bird Jar Breakable 50 A bird-shaped jar full of ash. I wanna break it. Bunny Jar Breakable 50 A bunny-shaped jar full of ash. Maybe I can smash it. Colourful Feather Bundle Decorative 90 Gorgeous, colourful feathers arranged like flowers. Decorative Alien Mask Decorative 55 This mask looks angry. Decorative Bird Decorative 90 Huge feathers are sprouting from this small bird statue. Decorative Skull Mask Decorative 55 This guy looks hungry. His eyes make me uncomfortable. Decorative Sun Decorative 80 Ironically, looking at this decorative sun sends a chill down my spine. Golden Bird Jar Decorative 50 This beady-eyed bird jar is made of solid gold. Golden Ducky Decorative 30 A golden duck! Kluex Gift Mural Decorative 400 An ancient mural depicting the gifts given by Kluex to his followers. Large Decorative Chest Storage 90 A chest adorned with ancient Avian art. Large Gong Decorative 95 A large metal gong. It's so tempting to give it a smack! Sacrificial Altar Decorative 110 An altar sticky with old blood and feathers. Ugly Temple Jar Breakable 40 What an ugly jar. Winged Urn Decorative 60 A winged urn, perhaps believed to carry the dead into the afterlife.